Ernesto Cervini is making a name for himself as a consummate bandleader and in-demand sideman. Time Out New York encapsulated Cervini as “a buoyant drummer as well as a sharp composer,” while the jazz bible, Downbeat, described his fluid style as one that “exemplifies `float like a butterfly, sting like a bee’.” Rev, his fifth album as leader, with his sextet Turboprop in October 2017.Reviewing the album, Frank Alkyer, Editor of Downbeat Magazine said: “The group has an infectious, propulsive energy that delivers a power punch without forsaking nuance and melody” while Modern Drummer states “Cervini recalls such old-schoolers as Art Blakey and Billy Higgins. . . It’s his robust, magnetic personality that fascinates consistently.”Rev was nominated for a 2018 JUNO award for Jazz Album of the Year (Group). 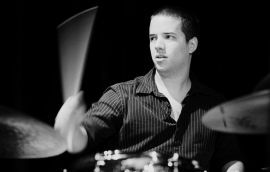 Born in Toronto in 1982, Cervini graduated from Canada’s Royal Conservatory of Music with a degree in classical piano and clarinet before focusing his energies behind the drum kit. After graduating with a bachelor’s degree from the University of Toronto and a master’s degree from the Manhattan School of Music, Cervini laid claim to a diverse musicianship, one that has taken him to some of the hippest, most prestigious stages in North America and abroad. Along with the live There (Anzic Records), the Ernesto Cervini Quartet has released the albums Little Black Bird (Orange Grove, 2009) and Here (self-released, 2006). As part of MEM3 with pianist Michael Cabe and bassist Mark Lau, the drummer also recorded Pennsylvania Grey, which The WholeNote called a “tour de force” and Circles.Cervini also co-leads Myriad3, with pianist Chris Donnelly and bassist Dan Fortin.The band has been touring extensively across North America and Europe. Their sophomore release, The Where was nominated for a Juno in 2015 and they will be releasing their fifth album, Diamond with Alma Records in the fall of 2018.